Keep track of your best projects so you can use them on your CV! These are some fairly short and simple tips to follow. They won't fit all cases but if you follow these, you'll have a solid CV that will get you somewhere. I'm in Ireland so most of my advice is tilted towards the market here - there might be some nuances for your local market you need to take into account. This is also aimed at technology roles - if you're not a techie, it's still pretty solid advice but you might need some other stuff I don't know about. And obviously, this is my opinion. This is my blog so I totally get to do that. Don't get annoyed if some other recruiter tells you your CV is shite. If you have three recruiters, you probably have about 5 opinions on CV's. If your career is a few years long or if you’ve held a few jobs in the industry (common if you have been contracting), it’s fine to have a longer CV. As long as your CV is not epic in length, it’s fine to go over 2 pages. If you are over 5 pages, and are not a very senior candidate, see if everything you have written is necessary. I've pretty much never cared about the length of someone's CV. For example: Python: Excellent. No one will know what metric you are applying. One person could consider themselves "Excellent" at Python if they get import a bunch of stuff and write a web app. Someone else might not consider themselves "Excellent" until they are capable of creating Python 4. Use other ways to demonstrate skills - describe projects completed using the skills, years of experience using the skill, courses/certifications obtained. That will tell people if you're any good or not. DON'T include your Leaving Cert / High School exam results. DO list achievements rather than duties. The difference between you and the worst person to ever do your job is what you achieved in your time in each position. List your most important projects or the projects you’re most proud of.If metrics are important in your role, list these and give an idea of how these fit within your team. (Average for team/ best in team) Highlight your individual impact, upskilling and team success. If you're thinking "But Evil Recruiter, I work in a dead-end hellscape with no opportunity for growth or initiative of any kind." First of all, sorry about that. Second of all, you'll still have achievements. You haven't given up because you're reading this about how to get your CV in order. You're not dead inside yet! So, list off everything you've done in the last year and pick out the best stuff. Imagine you're asking for a 25% raise. What would you tell your boss about the value you bring to the company. DON’T overshare on your personal information. The only personal details that should be on your CV are: Email address, Basic address. Phone number if you are happy to be called without notice. Don’t include your exact address down to house number. The general area is fine. Putting your address on your CV is leftover from the days when you would mail in a job application. If the general area is there, then that gives recruiters an idea if the location of a role might suit. (If your CV is up on Monster or similar). Do not include any of the following: a photo of yourself, marital status, age, passport number, PPS number, number of children, or blood type. THE THINGS people put on their CV's, omg. Racial identity. Long and weird details about their pets. I saw an IBAN number once. CV's already have a huge amount of personal information on them without giving a gift to identity thieves. DO put the list of skills above your work experience. (List of skills should go underneath experience if there are a very large number of them though) Limit the number of soft skills you write down. If the soft skill is something that is an essential factor to be a functional human, you don’t need to write it down. Things like "teamwork! ", "hard-working! ", "punctual!". If it is something that you learned before the age of ... say, 12, then you do not need to say you have it on your CV as a fully fledged adult. You want to maintain control of when your references are called. Recruiters can also use these contact details as leads. Anyone who is a reference is usually fairly senior and might be in a position to decide on hiring matters. You don’t want them getting a Business Development call from an agency they don’t want! For realz, this is a Recruiter 101 tactic. Not only do I have the details of your boss, I also know that they'll be hiring soon, and I have the CV of someone they wanted to hire in the past so I know what they're looking for. You don’t need to put “References available on request” on your CV either, this information is assumed. Would you write "References not available. Since the Incident"? Obviously not, like. So why say you have references? Everyone has them. DO include a description of your Thesis Project if you are a graduate. If you have just graduated, your final project potentially represents the largest piece of professional work in your career so far. It will tell an employer a lot about how you tick, what you're into, and could be the deciding factor between interview/bin. Include the technologies you used, a few lines about the project, and links to anything public - code, website, apps. If you think there is a reason a recruiter may ask you about it, include that information on your CV. You don’t need to go into details. Stamp 4 / Graduate visa / etc. If the company can’t facilitate sponsorship, it’s best to be clear upfront, it saves time! Hopefully these help. 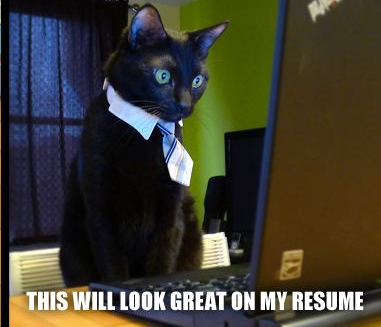 You can ping me on cv@evilrecruiter.com for advice. I have a bit of a lag period in replying because my day job is busy af at the moment but I will reply! Eventually! !